Da Nang Cathedral with nearly 70 meters high was built in 1923 by the priest Louis Vallet, it’s the only church built in Da Nang during the French colonial period. 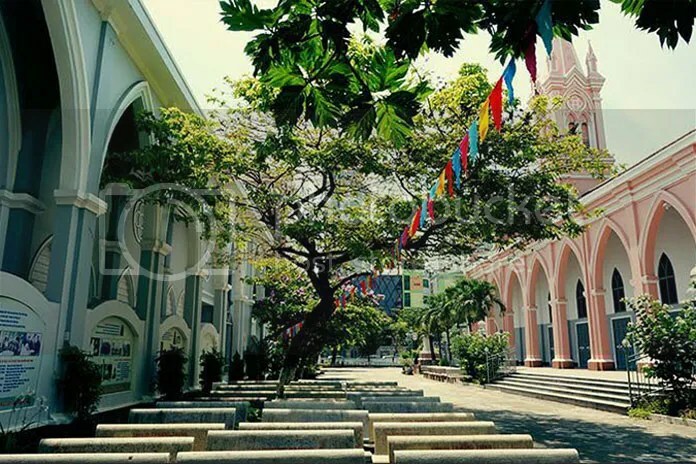 Da Nang Cathedral is the cathedral of Da Nang Diocese in central Vietnam. This is the only church built in Da Nang city in the French colonial period. The imposing, candy-pink cathedral is known locally by the slightly less imposing name ‘Rooster’ (Con Ga) Church. The name comes from the rooster that sits atop the impressive steeple. According to an explanation from the priest, the rooster on the roof of the church is not in fact the symbol of France, but is a symbol associated with St Peter’s story in the Gospel about repentance and awakening. Built in 1923 for Da Nang’s French colonial population, the cathedral is an easy half kilometer walk from the CBD. The church officially opened its doors on 10 March 1924 with the purpose of serving the French Catholics who lived in Da Nang at that time. Now, the cathedral still functions as a lively place of worship; in fact late-comers for services often find all the seats are taken.